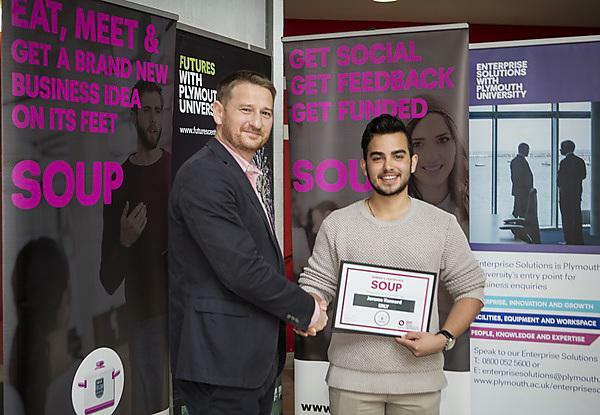 A student and entrepreneur has won the latest Soup event brought to the South West by GAIN at the University of Plymouth. Jerome Kennard will use his prize money to support his new venture, ERLY, which helps students find work experience with local businesses. ERLY is a network that connects university students with local businesses so they can gain work experience. Jerome will use his prize money to take his new venture – ERLY – to an international conference, Startup Grind, where he hopes to attract investors. This Soup event took place at Future Sync, a one-day community tech conference at the University. Jerome pitched ERLY against two other entrepreneurs to an audience who then voted for their favourite. A final year BSc (Hons) Business Enterprise and Entrepreneurship student, Jerome is originally from Trinidad and Tobago and lived in New York City before moving to Plymouth to study. His idea was recently one of 13 University of Plymouth student start-ups to be awarded a grant through the BETA Enterprise programme, run by the University’s Futures Entrepreneurship Centre. A keen traveller and surfer, Jerome aims for ERLY to be the place for students and businesses to find each other. Longer term, he wants all higher education institutions in the UK to use the service to benefit their students and to then take ERLY to a global market. Jerome pitched against two other local entrepreneurs: Stephanie Jasper whose start up business Your High Life offers getaways and corporate team-building experiences in a suspended tent and Corrie Barton of Plymouth creative studio Feisty Crab Studios. Now an international crowdfunding phenomenon, Soup began in Detroit. Audience members pay £5 to see new businesses pitch their ideas an over a bowl of soup before voting for their favourite with their spoons. The winner earns the takings to support their venture to grow, as well as a package of business support from the University of Plymouth and Devon Chamber of Commerce. This Soup event was sponsored by PKF Francis Clark. BETA is an extracurricular Enterprise Programme for University of Plymouth students who aspire to enhance their enterprise and professional skills and potentially start a new enterprise. BSc (Hons) Business Enterprise and Entrepreneurship is a two year fast track degree programme. This means we have taken the typical three year degree programme and condensed it in to two years so you have three years worth of modules over two years. In order to do this each year you have an additional semester (in the summer) than those studying a traditional three year degree programme. You still get a summer break between year one and year two.